To mark the end of Holy month Ramzan and beginning of Eid al-Fitr festival Turkish Airlines has taken a different route to wish people on the auspicious occasion. 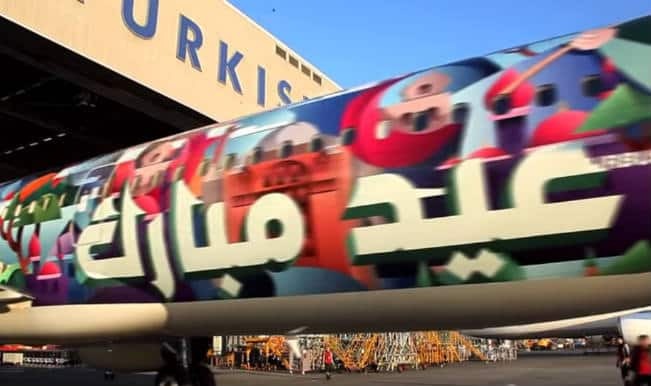 Passengers boarding the Turkish Airlines flight will be greeted with an “Eid Mubarak” message painted in Arabic and English on the both sides of A321 aircraft. The flight operates in 34 markets in the Middle East and North Africa. Turkish Airlines are trying to catch eyeballs this Eid al-Fitr and the new campaign looks innovative. They certainly are taking their campaign to soaring heights with specially designed aircraft. Well, the Turkish Airlines no doubt is trying to cash in on the festive season, but the airlines, in the month of Ramzan, has been doing charity as well. According to a press release, the Turkish Airlines has given over 300,000 Iftar meals to the underprivileged in 18 destinations across the Middle East and Asia.